Therese (Rooney Mara) is a 1950s average woman, with a luke-warm relationship with her ordinary would-be fiance. 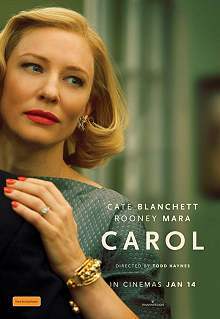 She serves the wealthy Carol (Cate Blanchett), and returns to her gloves that Carol left behind. They begin an unlikely friendship. Carol is a divorcee with a husband who won't let go. Therese would like to be a photographer. Although she hesitates to go to Paris with the fiance, Therese does agree to drive cross-country with Carol. Time together and talks develop the relationship, with Carol generous, and Therese stiltingly moving towards her. This is a low-key relationship that threatens the current lives of both women. They must decide about their lives, their priorities, and their feelings for one another. Carol is a gently-told film treatment of Patricia Highsmith's Price of Salt. The mid-century setting, with its expectations of women, shows us the bravery that had to be shown by women establishing themselves as themselves. These are the precursors of the sixties women's movement, not because they are political, but because they are trying to live lives that are true to their nature and talents.